October is the best time to see Berlin in the new light. And that is in the truest sense of the word! One of the most popular festivals in the world, Festival of Lights invites all fans of light art to visit Berlin in autumn. 05-14 October 2018 the German capital becomes the city of light: numerous Berlin landmarks, streets and squares will be illuminated in a colorful way and staged with light. The motto of this year’s festival is “Berlin – Connecting Cultures”. And the Festival of Lights 2018 will be as colorful and multifaceted as the cultural landscape of the capital is. Festival of Lights 2018 presents around 150 different artwork by 66 artists from different countries! If you don’t want to miss any of the light art works, choose one of the special light routes through the capital. It is the best way to discover the Festival of Lights. 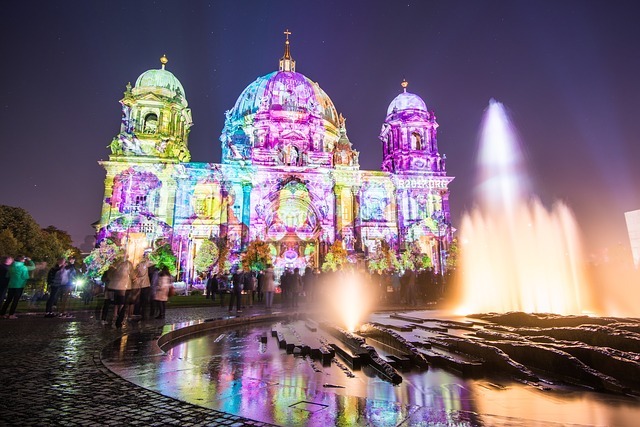 The most famous illuminated buildings and squares of the Festival 2018 are: Bode Museum, Brandenburg Gate, Loeser & Wolff House, Embassy of the United States of America, Bebelplatz, Technical University, Berlin Cathedral, Humboldt University, Embassy of the Republic of Singapore, Berlin TV tower, St. Mary’s church, Potsdamer Platz, Canadian Embassy and Europäisches Haus. All illuminations will light up daily from 7 pm till midnight. Breathtaking Videomappings on the historic buildings have been fascinating visitors of the Festival of Lights for many years. And since 2015 the World Championship of Projection Mapping has been an integral part of the light festival. Every year Festival of Lights offers international artists a new building for their productions. In 2018 the World Championship of Projection Mapping will present its artworks at the Kohlhoff Tower at Potsdamer Platz. Autumn is the best time to travel to Berlin: good weather, many interesting events, vibrant city life… For an unforgettable stay you only need an affordable and comfortable accommodation in the center of the city. Our hotel pension Classic is located at Wittenbergplatz in the district Schöneberg – all artworks of the Festival of Lights 2018 are nearby! And after the magical journey through the City of Light you will find everything for rest and relax in our cozy and comfortable rooms.